Retired Archbishop John R. Quinn of San Francisco, who led the Northern California archdiocese for 18 years, died on June 22 after a long illness. He was 88. The archbishop had moved to the Jewish Home of San Francisco from St. Mary's Medical Center on June 16, but he "experienced difficulties with his breathing early this morning," San Francisco Archbishop Salvatore J. Cordileone said in an announcement. "He was transported to the nearest hospital but could not be revived." "He stated several times since his move that he had achieved his goal of leaving the hospital for a new home where he could enjoy the fresh air, trees and the sounds of birds in the early morning," Archbishop Cordileone said, adding that the prelate's "initial days at Jewish Home had gone extremely well." "Our hearts are breaking at losing such a great priest and friend," Archbishop Cordileone said. "Join me in praying for the repose of his soul." Archbishop Quinn was the sixth archbishop of San Francisco, serving from April 26, 1977, until his retirement on Dec. 27, 1995. He was president of what is now the U.S. Conference of Catholic Bishops from 1977 to 1980. Born on March 28, 1929, in Riverside, California, he was ordained to the priesthood for the Diocese of San Diego July 19, 1953. Blessed Paul Vi named him an auxiliary bishop of San Diego in 1967. In 1971, he was appointed bishop of Oklahoma City-Tulsa. When the diocese was split to form the Archdiocese of Oklahoma City and the Diocese of Tulsa Dec. 13, 1972, then-Bishop Quinn became the first archbishop of Oklahoma City. Archbishop Quinn was one of the most influential members of the hierarchy when he was an active bishop. Ordained at 38, he became archbishop of Oklahoma City five years later. He served in that capacity for five years, then was appointed to head the San Francisco Archdiocese in 1977. There, he served until age 66, having asked St. John Paul II if the pope could appoint a coadjutor bishop so that he could retire early; the mandatory age at which a bishop is required by canon law to submit his resignation is 75. "I have served as a bishop for almost 30 years," he said in his retirement in 1995. "In these turbulent times no corporate CEO or university president remains under the pressure of office anywhere near that time." Archbishop Quinn, though, did something highly unusual for a bishop, even today: For four months in 1987 and 1988, he took a sabbatical. During that time, he went to the Institute of Living in Hartford, Connecticut, a clinic where he underwent a medical evaluation and dealt with issues of stress management and exhaustion. The medical evaluation revealed the existence of a benign tumor on his neck. He opted to not have surgery to remove the growth. He was the first bishop from the West to serve as president of the U.S. bishops' conference. In the late 1980s, he was chairman of the bishops' old Committee on Pastoral Research and Practices, and in the mid-1990s, he served as chair of their doctrine committee. A theology professor and seminary rector before he became a bishop, Archbishop Quinn maintained a keen interest in theological and ecclesial matters, and was able to pursue this interest in greater earnest after his retirement. Taking to heart St. John Paul's call in "Ut Unum Sint," his 1995 encyclical on ecumenism, that Christian church leaders and their theologians to help him find a way of exercising papal primacy that would better foster Christian unity. Archbishop Quinn gave a lecture the following year at Oxford University in which he called for major Roman Curia reforms, new ways of selecting bishops and a new ecumenical council. The outgrowth of the Oxford lecture was a 1999 book, "The Reform of the Papacy: The Costly Call to Christian Unity." The book won first place for best popular presentation of the Catholic faith in the Catholic Press Association's 2000 book awards, but was reportedly received coolly at the Vatican. Calling the Curia's structure is "a serious impediment" to Christian unity, "I firmly believe that if the politics and processes of the Curia do not change," Christian unity will remain elusive, Archbishop Quinn said after the book's publication. Archbishop Quinn maintained a keen interest in theological and ecclesial matters, and was able to pursue this interest in greater earnest after his retirement. He similarly called for a called for a re-examination of the role of the College of Cardinals, which he said presented a stumbling block to Christian unity. He made the comments in an interview with an Italian magazine that year. He added that future ecumenical councils of the world's bishops should include other Christian leaders, especially Orthodox, as full members. Archbishop Quinn in 1992 called a decision by the Jesuit-run University of San Francisco to give an honorary degree to U.S. Sen. Daniel Patrick Moynihan, a Catholic, who was a supporter of legal abortion, "a mistake," adding, " For my part, I regret the decision of the university and consider it a mistake because it is more than likely to be misinterpreted." In 2009, he defended a decision by the University of Notre Dame to invite President Barack Obama to deliver the commencement address and to receive an honorary law degree that year. Several U.S. bishops and other critics said Obama's support of legal abortion and embryonic stem-cell research made him an inappropriate choice to be commencement speaker at a Catholic university. In a 2009 article for America magazine, Archbishop Quinn said by such criticism by the bishops "communicated several false and unintended messages" to the U.S. public, adding it showed the bishops "function(ing) as partisan political actors in American life." He preferred a Vatican "policy of cordiality" which "proceeds from the conviction that the integrity of Catholic teaching can never be sacrificed" but "consistently favors engagement over confrontation." Archbishop Quinn had good relations with both St. John Paul and his successor, Pope Benedict XVI. 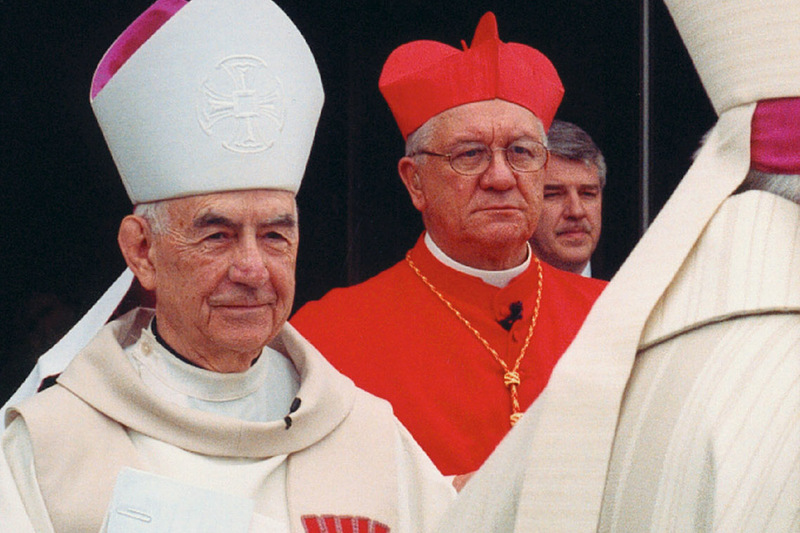 Archbishop Thomas Kelly, then archbishop of Louisville, Kentucky, recalled the 1979 papal visit, conducted when Archbishop Quinn was president of the U.S. bishops: "(The pope) always he came to it as a father full of love for our church. ... For the rest of the pope's life, he honored Archbishop Quinn for the association that they developed then." Archbishop Quinn himself remembered Pope Benedict as a "well-poised man who knew his mind" and "took criticism well," adding he had a "very satisfying working relationship" with then-Cardinal Joseph Ratzinger when both were involved in resolving controversies in the Seattle Archdiocese in the mid-1980s during the tenure of Archbishop Raymond G. Hunthausen and his decision-making authority. Archbishop Quinn was an early leader in combating clerical sexual abuse. The Archdiocese of San Francisco put into force in 1992 a sexual abuse and harassment policy, and at that time urged all victims of child sexual abuse by a priest or church worker to "come forward and tell us their story." Archbishop Quinn also was a staunch defender of immigrants and immigration. In 1994, shortly after California's controversial Proposition 187 was approved by voters, he issued a pastoral letter in which he lamented the growing hardness of heart toward immigrants, which he called "appalling and so profoundly in conflict with the Gospel," saying it was behind a wave of blaming immigrants for economic and social problems. The proposition, which was found unconstitutional by a federal court, barred anyone who is in the country illegally from receiving any tax-supported benefits except emergency medical care.